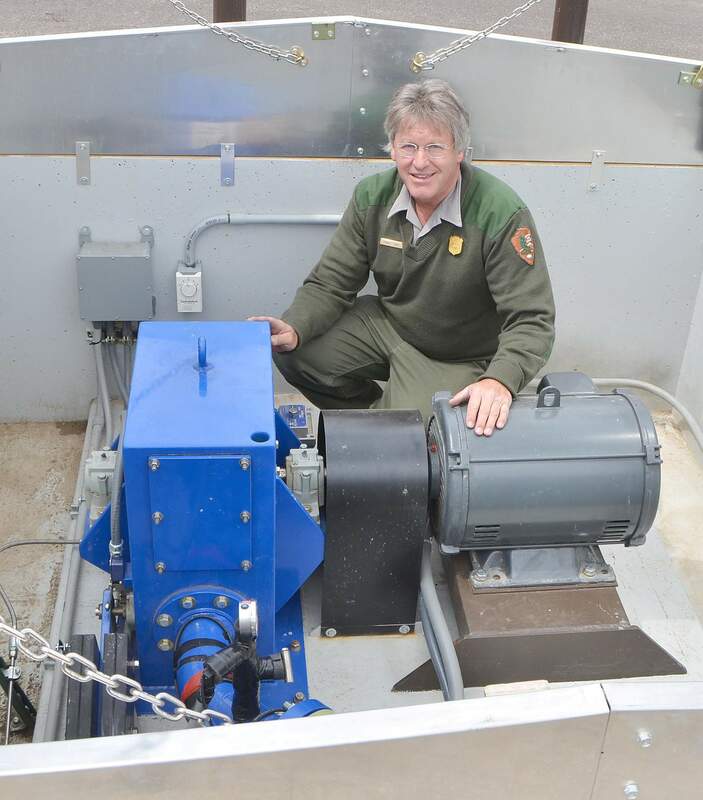 The newly installed micro-hydroturbine takes advantage of water being piped in to create electricity, said Frank Cope, facility manager at Mesa Verde National Park. The Mesa Verde Visitor and Research Center, which opened in December, has a photovoltaic solar array to generate electricity. The park is planning an official grand opening on May 23. The Spanish “mesa verde” translates to “green table.” Turns out the name is apropos, in more ways than one. Walking through the new Mesa Verde Visitor and Research Center, a visitor gets the feeling the place is a living creature with a mind of its own. The ambient lights turn off and on by themselves. So do the air ventilators. Sensors detect human movement. They also pick up slight variations in sunlight brightness and exhaled carbon dioxide. Systems adjust accordingly to keep the building comfortable. And efficient. In fact, the entire facility and grounds, which opened to the public in December, were built with energy and water conservation in mind. Technology, for all its perks, always comes with a headache or two. Frank Cope, facility manager for Mesa Verde National Park since 1999, says his job has temporarily grown more complicated as the new systems go live. But long term, he thinks it will get simpler, because the central computer – smaller than a shoebox – monitors and regulates so much information automatically. A visit to the control room shows it. On a laptop screen, Cope can pull up room-by-room temperature readings, and each light fixture and mechanical device is accounted for. If a utility problem arises, it can usually be fixed remotely through the Internet unless hardware itself is damaged. Downhill from the parking lot, faces tilted skyward to absorb sunlight, is an array of 325 gleaming photovoltaic solar panels. Cope said the panels, almost counterintuitively, perform best in winter. While there are fewer hours of daylight, cold, clear weather is optimal for conducting electricity. 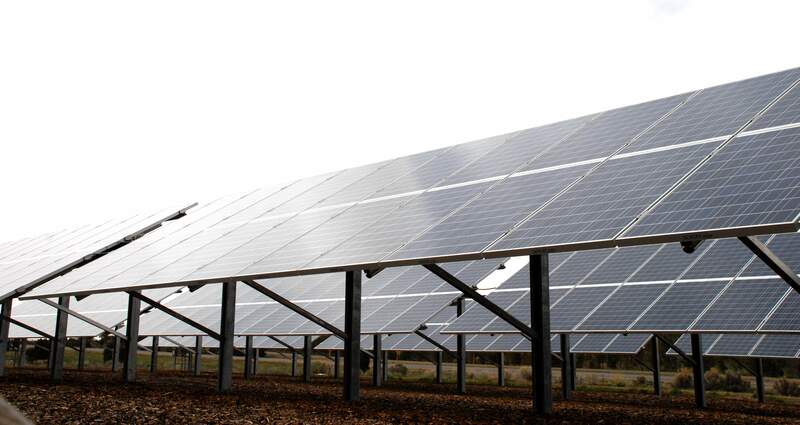 The panels are fixed at a 37-degree slant, the same number as Montezuma County’s latitude. This orientation means sun rays hit the panels directly perpendicular, the ideal angle. A smaller rooftop array just off the main building heats water for restrooms below and also powers the in-ground snow-melting system on the front terrace. Mesa Verde’s potable water is well-traveled. It comes from the Mancos River, at the base of the La Plata Mountains, about 17 miles away. For the last 19 years, that water has funneled into an underground 50,000-gallon tank, as a pressure break, before getting treated and piped to buildings. When the new visitor center was built, designers observed that the flow could be tapped for energy. Their answer was technology used since ancient Greece – a water wheel – but with a modern twist. They installed a 25-kilowatt micro-hydroturbine. Now, water is drawn up a large green pipe and into a blue chamber containing an 18-inch water wheel. When the water sprays against the wheel paddles at high velocity, the rapid spinning engages a generator, producing more electricity. Cope said Mesa Verde does not store the energy it creates. Rather it works with Empire Electric Association to “synchronize” with the power grid. As the solar panels and turbine work, the electric meter turns backward and dollars are saved. Many homeowners take advantage of utility company rebates and U.S. Department of Energy tax credits to help “weatherize” their houses. Standard methods include adding insulation to attics, sealing loose ducts and cracks, and replacing old energy-guzzling appliances with efficient ones. Proponents of weatherization argue that heated or cooled air escaping through poorly sealed walls and windows is, well, money out the window. The DOE estimates that every dollar spent on weatherization reaps $1.83 in direct savings. With the visitor center, instead of retrofitting later, designers wanted to get off on the right foot. The tan-colored vinyl roofing deflects heat. Toilets and sinks are low-flow. Windows are doubled-paned, filled with inert gases and a piece of crystal film. The gases lower the thermal conductivity of the glass and, depending on time of year, keep hot and cold from getting in. Mechanized shades are pulled down over the windows at night to seal in warmth. “There’s insulation like you wouldn’t believe,” Cope said. Speaking of windows, they’re everywhere. Three-quarters of the building’s interior is illuminated by natural light; the only exceptions are utility rooms and the artifact repositories. In the not-too-distant future, the Mesa Verde Visitor Center is aiming to generate as much power as it uses, a status called net zero. Right now, it is about two-thirds self-sustaining. Once the systems are calibrated, the building begins a one-year monitoring period to prove the conservation technology is working. If it meets all benchmarks after 365 days, it can remain certified as “LEED Platinum” by the U.S. Green Building Council, the strictest category of energy-efficiency. The distinction doesn’t come cheap. Cope estimates the sustainable energy upgrades comprised 25 percent of the building’s total cost up-front.